White Dwarf #85 takes us to start of 1987 and a new editor. Mike Brunton, the new editor, talks about the scope of the each issue. How if they dedicate too much space to a particular game some people will love it, others will feel left out. 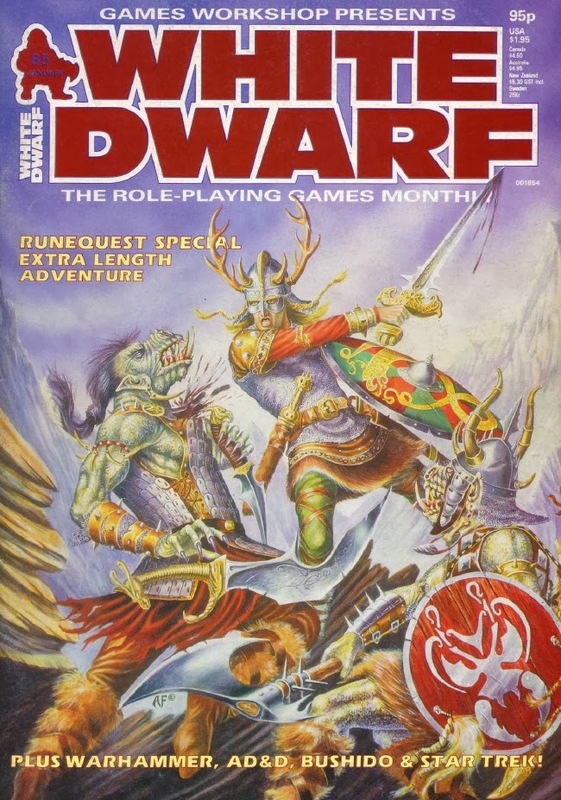 This issue in particular is a RuneQuest focused one. The cover art is interesting. Not the Heavy Metal fare we have been getting, but something that looks like a RuneQuest cover (it might be for all I know). Briefly in Open Box we get Bloodbowl, a game I always thought was interesting looking but never tried, and some D&D books. The D&D books covered are the Wilderness Survival Guide, the D&D BECMI Creature Catalogue (sic) and the first mega-module GDQ1-7 which combines the previous Giants, Drow and Queen of the Demonweb Pits adventures into one and looses something in the translation. The WSG is enjoyed by Carl Sargent. He claims that any FRPG could use it. I think he is correct, I remember that most of the tables were straight percentages. The Creature Catalog is also enjoyed by Tim Brinsley with special note given to Frank Mentzer's guide to balancing encounters. It is worth it for that alone I think. Note this is the AC9 version and not the DRM 2 version, though I would not be able to tell you the differences except for publication date. We also get a brief review of the Bard Games supplements, The Arcanum, The Lexicon and The Bestiary. These were the must have books back when I was in college and had discovered college town used books stores. 20-20 Vision covers some movies. Perennial gamer favorite, Labyrinth is reviewed. Though Colin Greenwood says that Bowie looks too much like his 1973 version, but lacks the style of Ziggy Stardust. I rewatched this a while back. While I get a nostalgic joy from it, and the songs are still maddeningly catchy, the story is weak. Though it was not till someone pointed out that "Requiem for a Dream" works as a sequel to this, continuing the story of Sarah and her guilt for the loss of her brother Toby, that I got some new joy from it. Critical Mass covers some then new books. Though I don't recall reading any of these save for the reprint of the Chronicles of Corum. This was the time I was leaving fantasy, having already left sci-fi, and had moved on to horror. By the end of 87 I wasn't reading anything at all unless it was somehow tied to the Cthulhu mythos. Allan Miles gives us Only Skin Deep which talks about the human-centric view in AD&D and how the various demi-human races get short changed on a number things. For starters he says, and I agree, that there should be no level limits on many of the classes. In particular fighters. Honestly while this is interesting for the time today we live in a post 3.x world where every race can advance in any class. Level limits on demi-humans are now imposed in OSR games purely out of nostalgia and not really for a game-balancing mechanic. Back in the day we never bothered with level limits. We kept class restrictions though. Still, the article is a fun read since it is not as dogmatic about the rules of the game and instead tries to find good reasons to do the things it does. Often the answer is "that reason doesn't make sense". A brief bit on playing the FASA Star Trek game. A Tale to Tell is a RuneQuest III adventure and the main feature of this issue. At 16 or so pages it is the largest adventure I can recall to date. It's a big adventure. I have a hard time though judging if it is any good. It reads fine and it is the sort of adventure I have come to associate with RQ as opposed to the dungeon crawls of D&D. The color pages are saved for some ads and 'Eavy Metal. Dragons this issue. Swords of Pendragon is not for the Pendragon game, but rather a system agnostic bit of fluff about the various swords that have appeared in the King Arthur tales. No stats, just some background info. An ad disguised as an article, "Illuminations" covers fantasy art. This time all from the new Warhammer Fantasy game. It is good art though. Fracas covers the last parts of the Reader Poll. Some of the polls that are of interest to me today are the one about computer use in games. 65% said they have one and use it in gaming. By this point I was using a combat simulator that sped up combats for my AD&D game. It was written for the old TRS-80/Tandy Color Computer and yes I still have it. Just no CoCo to run it on. The vast majority, 4,121 respondents vs 1,177 say they use miniatures in their games. Granted there is a larger proportion of Warhammer readers here than say the national or even worldwide average. Still this goes a bit against the idea that the use of computers and minis are somehow something new to gaming. Men outnumber women in this poll 86 to 1. The top four RPGs according to the poll are MERP, AD&D, CoC and Warhammer. The average age of the responder is 16 and has been playing 3.8 years. So what does this issue give us? Well there is obviously a change in the air at WD. We have gone through more editors in the last few issues than the 60 issues prior. The focus is shifting, though unless you know the future you really can't say what. Yes there are clues, but this seems to indicate that we will see more MERP as well. 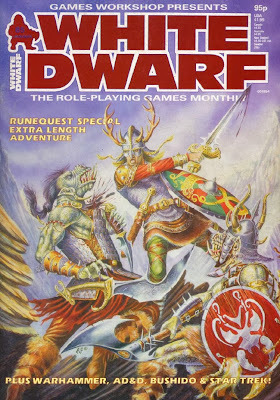 That is a RuneQuest cover - its the one that Games Workshop used for their hardback printing of "Basic RuneQuest" (i.e. the core rules) in the UK. The adventure was later re-jigged a bit and published as part of the "Shadows on the Borderlands" scenario pack by Avalon Hill, along with a revamp of The Black Broo of Dyskund (from WD51 or so) and another very atmospheric adventure called Guamata's Vision. Worth seeking out. It's not a bad adventure, and the High Holes Caverns are a great environment, but it's got some tough opponents.